Due to set sail in 2020, P&O’s Iona is a celebration of the sea and nation. She is set to boast innovative spaces and offer the ultimate respite as you view the ever-changing coastlines of the world. 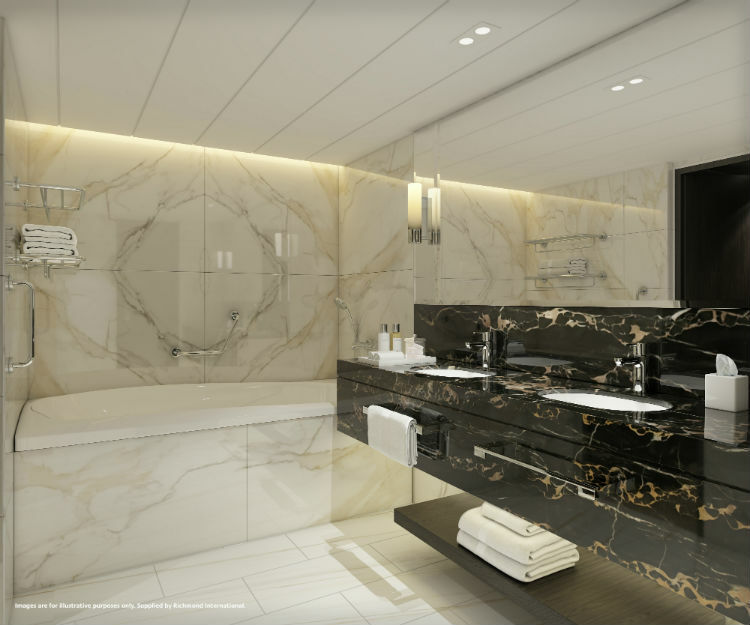 Images of Iona’s cabins have been newly released by P&O, highlighting the luxurious standard and cutting-edge technology ready to wow you when you step on-board. The interiors are sleek and elegant, with an impressive central staircase and boutique cinema to catch classic films to recent blockbusters. 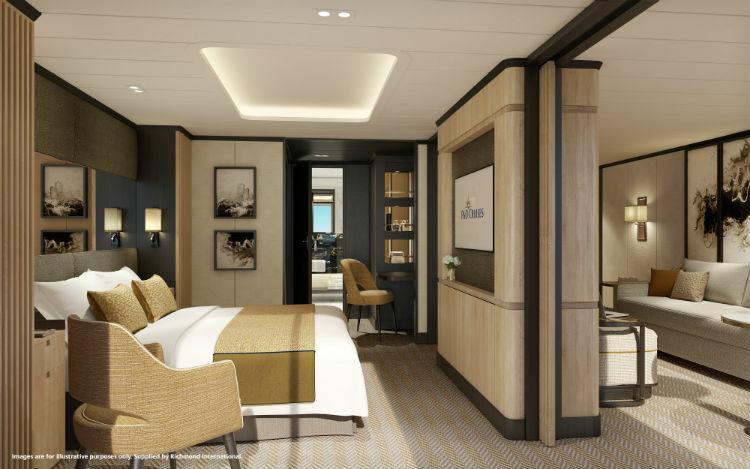 This is an exciting new addition to the choice of accommodation on-board P&O Cruises and will feature as a signature option on-board Iona. The Mini-suite will offer a versatile conservatory room which is an extension to the cabin and brings the outdoors in for the truly distinctive relaxation and socialising space. The Mini-suite also includes seating to enjoy a quiet coffee in the morning, while the evenings can be spent relaxing on the balcony which is perfect for private celebrations and socialising over pre-dinner drinks. The room opens fully out onto the balcony, with a direct connection to the sea and stunning views. Both these suites offer guests the ultimate relaxation of their own, with a boutique-hotel-feel. Iona’s suites feature contemporary comfort and elegance, with interconnecting rooms to open fully into a brighter studio ambience. The design of the room focuses on comfort and light tones, with the upholstery in sands, beiges and off-whites further complemented by accent furnishings of mustard and navy hues. In the bathroom, there are double sink units set in black marble, surrounded by white marble walls and floor tiling. All suite guests on-board Iona will benefit from separate lounge and bedroom areas, dressing areas and spacious en-suite bathrooms. They also have direct access to large balconies and offer exclusive services such as personal butlers and a range of in-suite dining options. The balconies on-board Iona come in a range of four choices: Deluxe, Balcony, Single and Standard. Each of these offer extended private spaces to relax and unwind, whether enjoying a cup of tea in the morning or watching the sun set with a night cap. Guests can also experience private dining with the room service menu. For larger groups and families, the balconies have been skilfully designed to include drop-down bunk beds and flexible sleeping arrangements to maximise living space. Iona will also offer Sea View cabins as outside accommodation as well as inside cabins. With these, the colour themes and design are also inspired by the seaside feel with porthole mirrors and accents of blue and gold within the soft furnishings and accessories. Storage within the cabins are also maximised with all options including personal touches and a stylish and comfortable atmosphere. Facilities include tea and coffee making facilities, well-stocked fridge, in-cabin TV and a bathroom boasting soft towels and toiletries courtesy of The White Company. 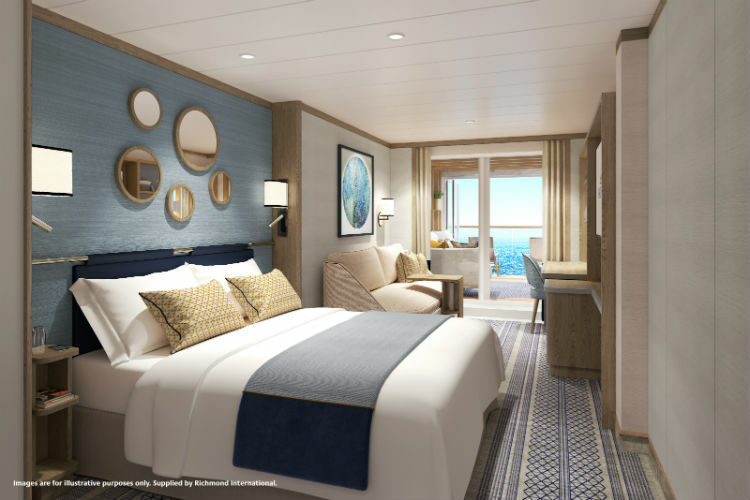 Both the public spaces and cabins were expertly designed by Richmond International, assisting with the process of designing and building the cabins and making the accommodation more distinctive for guests yet to step on-board. You’ve worked with P&O Cruises before. In what way does Iona’s design brief differ? 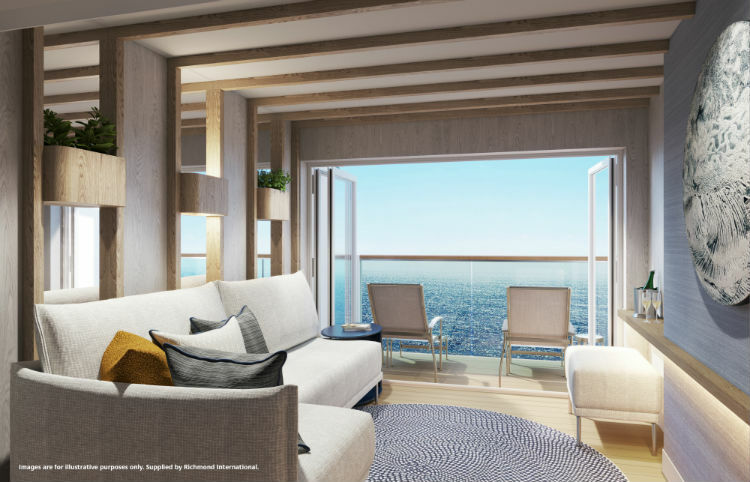 TM: The Richmond team were the interior architects for all the public areas and guest cabins on Britannia, and we were invited to work with P&O Cruises again to design some of the public areas, as well as the accommodation for Iona. Britannia’s interior design concept was based around the brief of a ‘5-star hotel at sea’, whereas Iona’s direction is ‘British contemporary luxury’. We’re focussing on a seaside feel and embracing the concept of the ‘sea as the star’. Where are Iona’s cabins being built? TM: The cabins for Iona are being built in Germany in a factory close to the shipyard. They’re manufactured as complete individual enclosures with all floors, ceilings, partitions, windows, air conditioning, lighting, electrical and plumbing services, bathrooms, decoration and furniture fitted. The individual cabin construction and finishing process is carried out on a large, slow-moving conveyor belt system that passes through each technical construction and fit-out zone. The result is that completed cabins ‘roll off’ at the end. This is an amazing process to experience – it’s similar to a car manufacturing plant, but the major work is carried out by a skilled, hands-on workforce rather than robotic automation. These fully completed units are then transported to the shipyard and inserted one by one into the hull carcass. They are then finally connected up to the ship’s main services and structure. 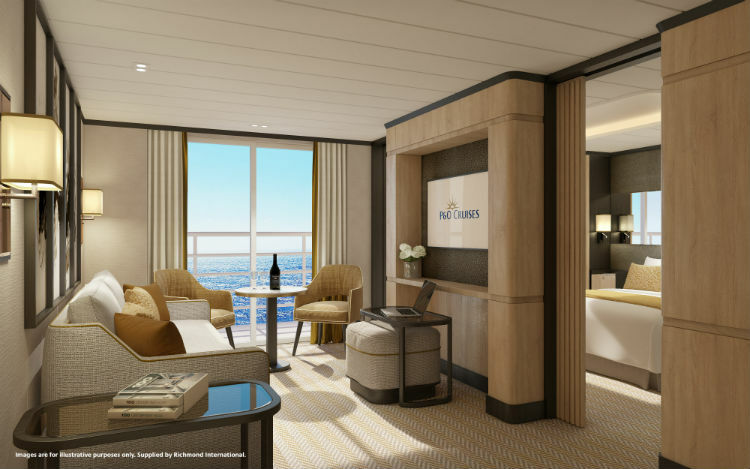 The Conservatory Mini-suite cabins are new to P&O. Can you tell us more about them? TM: The new Conservatory Mini-suite cabins create an exciting addition to Iona’s accommodation options. We’ve created a personal, versatile outdoor/indoor room that can be an extension of the room – a space to either relax or entertain in. This space can be closed off in the morning for guests to enjoy a quiet early morning ‘coffee moment’ while everyone else is still asleep. The Conservatory Mini-suite area can then open fully and directly onto the balcony to provide the connection with the sea. It creates a cool, shaded area to chill out in by day. In the evenings, it can transform into a space for private celebrations or a social zone for pre-dinner drinks with friends and family. 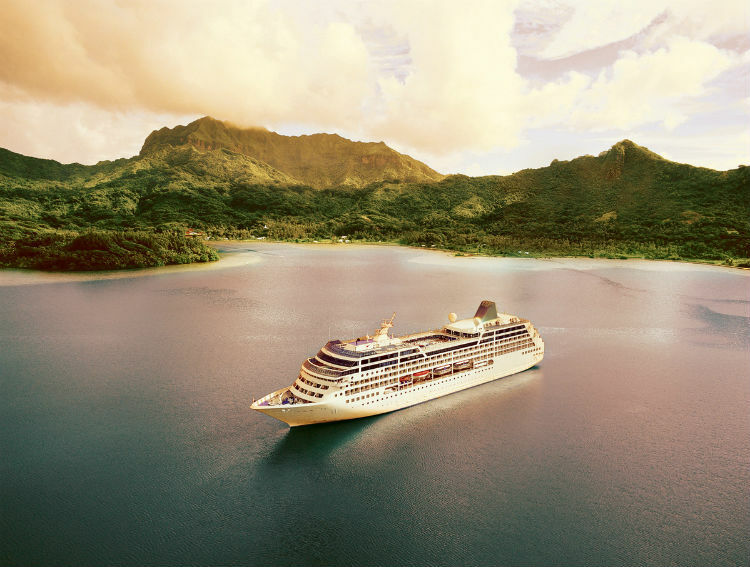 If you can’t wait until 2020 to set sail on-board this stunning ship, book yourself a P&O Cruises for 2018 or 2019 and enjoy a cruise full of British hospitality and excellent standards of service. For any further questions or advice on booking a P&O Cruise, call our Cruise Concierge team on 0808 1234 118 for expert guidance and award-winning service.